It seems like more and more food boasts that it is gluten-free on the packaging. Is this just another food fad being pushed by marketing agencies? Or is there a real medical need for a gluten-free diet? Gluten is a protein present in wheat, barley, and rye that can be found in foods like bread, pasta, cake, cereal and beer. Gluten is also added as a stabilizing agent to some unexpected foods like ketchup and ice cream. Maintaining a gluten-free diet can be difficult and expensive, so most people on this restricted diet have Celiac disease. Over 2 million people in the United States have Celiac disease, or 1 in 133 Americans. Celiac disease is a common genetic disorder in which a person has an autoimmune response to gluten. Symptoms can vary widely, but common symptoms include diarrhea, bloating, and abdominal pain. These symptoms are caused by the person’s immune system mistaking the gluten as a hostile organism. As the immune system attacks the gluten, the small intestines are inflamed and damaged. Currently people with Celiac disease have to rely on a lifelong gluten-free diet. However, researchers have recently discovered the cause of this immune reaction, as reported in the peer-reviewed journal Science Translational Medicine. A large study was performed by scientists from Australia, the UK and Italy. These researchers recruited 226 volunteers with Celiac disease (age range 19-70 years, average age 50 years, 73% women) and a control group with similar characteristics. Prior to participating in the study, the volunteers with Celiac disease had been strictly gluten-free for at least 3 months and the normal controls for 1 month. During the study, the volunteers ate foods with gluten — barley risotto, slices of wheat bread, rye muffins, or a combination of these over three days. Eating these foods induced an immune response in the volunteers, causing their bodies to produce gluten-specific T cells (a type of white blood cells that are important in the immune system). Blood samples were taken for each volunteer at the time of the first “grain eating challenge” and 6 days later. Researchers then performed complicated laboratory analysis of these T cells from the blood samples. The researchers identified three key substances (specific peptides) in the gluten that caused most of the immune response. These key substances were found in all three grains — wheat, barley and rye. 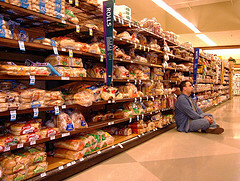 Effects of other gluten substances were found to be negligible in comparison. This breakthrough in understanding Celiac disease should lead to new treatments, such as immunotherapy. In immunotherapy, a person is repeatedly exposed to toxins that cause an immune response, eventually causing the body to tolerate the toxins. This technique is commonly used to reduce allergic reactions — e.g., to grasses or pets. The researchers are now designing and testing an immunotherapy for Celiac disease, based on using the three identified key substances in gluten as the toxins. This new therapy is now being tested as a phase 1 clinical trial. Hopefully some day soon people that suffer from Celiac disease will be free of a gluten-free diet.